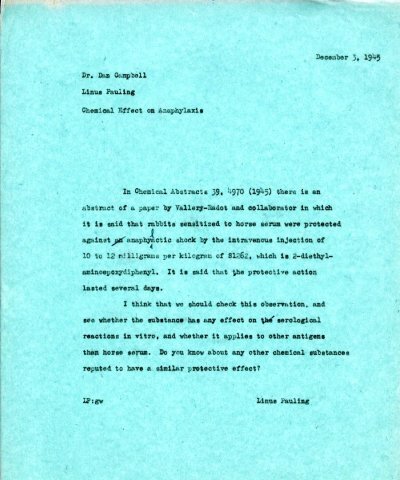 In Chemical Abstracts 39, 4970 (1945) there is an abstract of a paper by Vallery-Radot and collaborator in which it is said that rabbits sensitized to horse serum were protected against anaphylactic shock by the intravenous injection of 10 to 12 milligrams per kilogram of S1262, which is 2-diethyl-aminoepoxydiphenyl. It is said that the protective action lasted several days. I think that we should check this observation, and see whether the substance has any effect on serological reactions in vitro, and whether it applies to other antigens than horse serum. Do you know about any other chemical substances reputed to have a. similar protective effect?